The Lightbulbs - "Makeshift 16"
The Light bulbs are a trio consisting of Mike Richards, Dustin Freeman and Shawn Cummings. 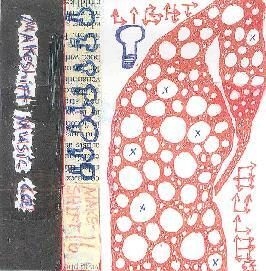 This album was originally recorded and released on cassette in 1998. Makeshift 16 is around the 45-minute mark in length and its 19 tracks are varied in feel. "AdayInTheLifeOfAPackersFan" is an interesting track, but it is too short. It is track 4 and a lot of these tracks are what I can call interludes to other longer pieces. "AdayInTheLifeOfAPackersFan" is a one of those longer pieces, an interesting heavy vibe, good rhythm. There is a lot of acoustic guitar stuff on other tracks, and assorted noise elements, drum machine beats, attempted psychedelic moments and an array of other anomalies. It all intertwines together like one long piece and is full of noise creations that are very hard listening. Very thrown together sound wise. I’m a big fan of low budget stuff, but the bottom line is “The quality does not matter if the music is quality in itself” This sadly is not quality music. I have tried to find good positive things to say, but I can only say that my favourite track is the above mentioned. This track has a band sound, bass, drums and guitar. It is heavy in places and it has a good rhythm. That is all, out of 19 tracks I like one and find the others are things that anybody with a basic idea to create noise could come up with. You can structure noise pieces, give them emotions, let them work things inside sound. Give them a hint of moving to and from a destination rather than create a piece that is numbing with no real state of going anywhere. It sounds like an album that has went too far. It is not inspiring to listen to, and it is rather like an attempt at the strange while under the influence of Aspirin rather than LSD.